Looking for camping stoves? Check out our Buyers Guide! Is there a better feeling than throwing on the camping stove, prepare the food and let the day come to an end while enjoying a nice meal after a rough tour? The outdoor stove will provide warm coffee or tea in the morning - that is how a successful touring day is supposed to start. It is even more annoying if the stove does not give the desired result, does not get warm or dies completely. This is why you should look for especially good quality when picking a camping stove. If you are passionate about mountain sports or hiking and are trying to keep the weight as low as possible, there are camping stoves that are extremely compact and ultra-lightweight. 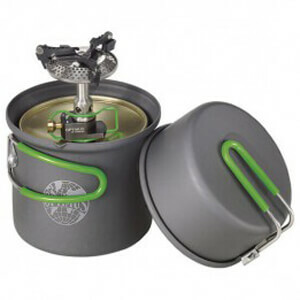 Should you prefer to go by car and are looking for something to cook on while camping, you better go for a durable and stable camping stove. You will not find suitable fuel for your camping stove everywhere. If you are on the road frequently in the southern countries, you will find out rather quickly that you can not always find the right cartridges for your gas stove. In that case you should buy a stove that can work with several fuel types. You should always inform yourself beforehand whether the necessary fuel for your camping stove is available in the country you are travelling to. The simple choice when it comes to transport and handling are certainly gas stoves, outdoor stoves are the most flexible since they can run on gasoline, petroleum and diesel. Our customer service will be happy to answer any questions about outdoor stoves.